Sitting at a computer monitor for extended periods of time. 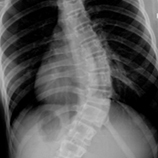 Misalignment of the vertebrae and/or ribs. Strained muscles, possibly due to accident or injury. Pain in between the shoulder blades may be referred pain from another part of the spine. It is not uncommon for rib involvement to be the cause of middle back pain since the thoracic spine attaches to the ribs. Anyone who has ever had a displaced rib knows that the pain can be sharp and can even make it difficult to take a deep breath. Intercostal neuralgia is caused when the nerves adjacent to the ribs become inflamed. Chiropractic care can help correct and relieve many of the problems cited above that cause mid back pain. The cause of your mid back discomfort will be determined by a thorough examination of the spine, so an appropriate back pain treatment plan can be determined. Mid-back pain responds well to spinal manipulation and therapy modalities. Therapeutic exercises may also help since the right exercise program will address muscle imbalances to help relieve symptoms and prevent re-exacerbation. Contact our chiropractor online to discover mid back pain relief via chiropractic care.